Livermore Valley, CA – The Livermore Valley Winegrowers Foundation and The Wente Foundation for Arts Education will present checks to the beneficiaries of the Livermore Valley Wine Auction on Tuesday, August 6, 2013 at 5:00pm at the Purple Orchid Wine Country Resort and Spa, 4549 Cross Road in the Livermore Valley. Media and guests are invited to attend from 5:00pm to 6:00pm to enjoy a wine and cheese reception plus a short presentation and photo opportunity. Following the check presentation will be a dinner hosted by the Livermore Valley Winegrowers Association. To RSVP for the reception and/or purchase tickets to the dinner, please contact Brandi Addington at membership@lvwine.org. The Livermore Valley Winegrowers Foundation and the Wente Foundation for Arts Education are pleased to announce that $280,000 was raised at the 19th annual Livermore Valley Wine Auction on May 11, 2013 for the five beneficiary organizations: OpenHeart Kitchen, ValleyCare Foundation, Happy Talkers, Bankhead Theater, and Livermore Valley Education Foundation. The Livermore Valley Wine Auction was generously sponsored by the following companies as Master Sommelier Sponsors: FedEx, Diablo Magazine, The Safeway Foundation, and The Rose Hotel. Many other local companies sponsored at the Sommelier, Wine Lover, and Friends of the Foundation levels, as well as donated items to the live and silent auction. “The tremendous support we receive from sponsors and donors makes the Auction a great success,” said Peter Leary, President of the Livermore Valley Winegrowers Foundation Board. The Wine Auction, held in the Barrel Room at the Wente Vineyards Estate Winery, was attended by approximately 300 guests who enthusiastically bid on 61 silent auction items and 22 live auction packages. In addition, the guests generously raised their bidding paddles during the Fund-a-Need portion, raising $30,000 for Open Heart Kitchen. During the silent auction, sixteen Livermore Valley winemakers poured their wines, showcasing the range and quality of wines grown and produced in the region. The mission of the Livermore Valley Winegrowers Foundation is to raise funds to improve the quality of life for under-served local children. 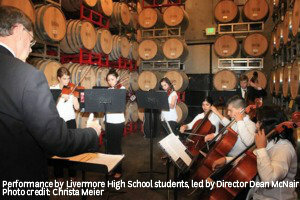 The mission of the Wente Family Foundation is to provide support for arts education programs in the Livermore Valley and throughout the United States. For more information on LVWF, please contact Brandi Addington, Auction Manager, at auctionmgr@lvwf.org or (925) 321-8338. For more information on the Wente Foundation for Arts Education, please contact Kimberly Charles at kcharles@charlescomm.com or 415|701-9463.